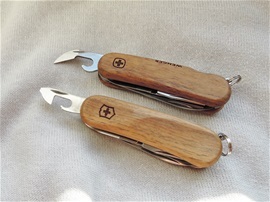 Here are two of the New Victorinox Delémont knives. One is the 0.9553.MC RangerGrip 61 that I will talk some about today and the very first impressions of it. The first I can say that this is a Swiss product for sure. Everything is or gives a quality impression. I did get a bit emotional because the changes are more than I expected. In addition to the already mentioned modifications on the internet I can see the rivets and liners are different and the design has changed much. 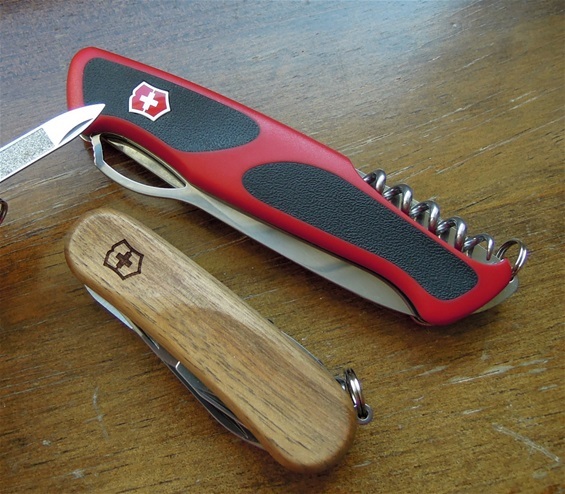 We know that the Delémont plant is still going and the workers make the knives for Victorinox. There are still remaining much of the 130mm Ranger and this is for sure a nice product. The locking mechanism got some modifications but basically it remains the same type. There is still some small play on this mechanism. This is normal and it is a lock to prevent accidental closing. The design and shape of the handle scales are different and the ergonomics is therefore changed. I can tell for sure that 1893-2013 is Wenger and the rivalry ended in the early 2000s. Wenger knives are no more but the workers and the plant is there. 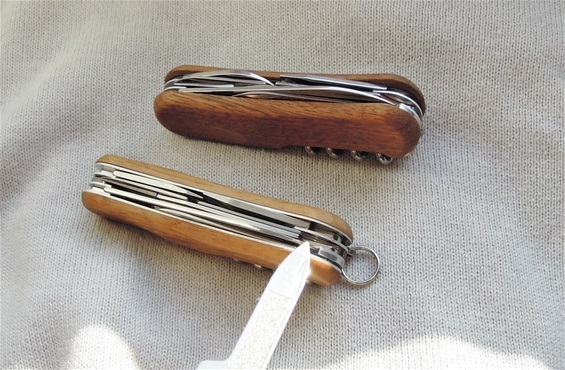 I have no problem recommending SAK enthusiasts to get one. I understand that enthusiasts have their own opinion and decide out of feel. The workers are there and there is a legacy in this knife. It is a Swiss product! En liten tåre for Wenger idag! There is one part that i can already see and this is the thicker liner for the locking mechanism. It is a stronger liner with more tension. This is probably well but the push button release ( to release the lock and fold the blade in)may get more worn by this extra pressure to release it. It may be no problem. It is a bit interesting but hard to picture. Under the locking liner type there are a few notches. Maybe if the blade should accidental close past the first contact and bend the liner out the blade would or may have secondary safety to prevent the blade to fold over the hand. The locking mechanism would be completely damaged and the blade would stop at an angle. It is a bit to early to say. I have never had a problem with any lock for normal use and i like this mechanism. It is interesting. 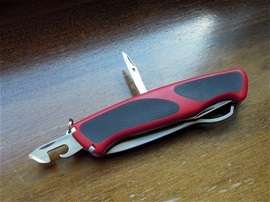 Usually if a blade lock should fail the blade would be forced to the side. Probably these notches are related to the placing and cut from the dividing steel liner and how it rests. I always use a knife as there is no lock but this is a well product. 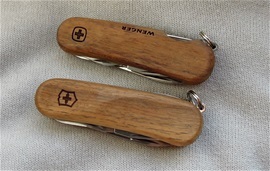 Ok today i will talk some about the very first impressions on the 2.3901.63 Victorinox EvoWood 14 from the Delémont plant. There is already much information on the internet, in my hand I can much better see the modifications and philosophy change on this EvoWood model. My absolute first impressions of this knife are that it is a Swiss Product. One thing that Wenger did with the introduction and philosophy in the design was the use of a very innovative quality. The sideliners are now in the same shape as the wood handles and this changes the Wenger philosophy much. 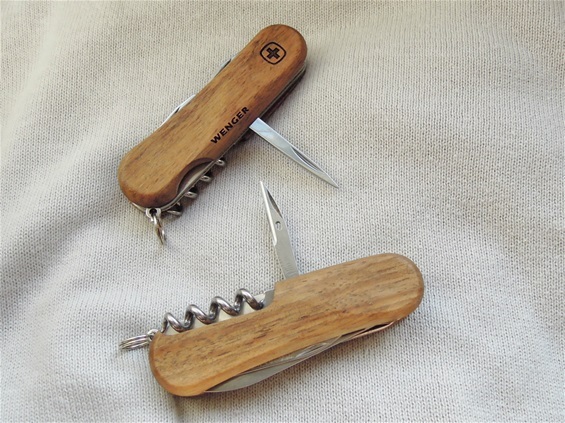 I can tell that the Wenger wood handles before the merging and by accident was put in a washing machine for clothes. It was trapped in a pocket but it took the full cycle at 40 degrees with the washing liquid and softener. No damage to any parts of the knife or wood on that EvoWood 17. I hope this same quality will continue on the new as well. It is a very nice knife too! On the picture are two EvoWood 14, one is a Wenger. There are more modifications and new stamps as well. The philsophy of the awl is different. Both are very useful! The sideliners are more visible and in theory this would strenghten the normal exposed wood material. It is not as beautiful. This is a change in the design. I did mention how strong the normal Wenger handles was so i am not sure about the change. I do like it and it is a nice knife. There is an added function with the small flat screwdriver and it is well. The new awl can now we used to drill holes in wood or other materials. Sewing eye too.